Ontarget’s online marketing services include SEO, PPC, targeted banner advertising, local advertising, social media, email marketing, etc. Our goal is to drive low-cost leads to our client’s website. So many companies use the term online marketing services but they only doe SEO or Pay-Per-Click (PPC) advertising. We’re a full-service online marketing company. We don’t go into a discussion with a solution in mind. We take into consideration the company size, budget, audience, products, lead fulfillment process, etc. and then we create a solution based on all the online marketing services we provide. Some advertising solutions can be very targeted and cost effective but require a large monthly budget. Other solutions don’t require a monthly budget at all. Internet Advertising – We can advertise to people right around your store or nationally across the United States. We can advertise to people that have been to your site but didn’t buy anything. We can advertise to people that are entering specific keywords in a search criteria. Cost Per Click – Cost Per Click or PPC is search advertising. We start with an exhaustive list of keywords based on what people are searching for relating to your business. We optimize the search architecture each month taking out keywords that are driving traffic but have a high cost-per-conversion. We care about what a lead or sale cost not how much a click costs. Search Engine Optimization (SEO) – SEO is not just something you do when you redesign your website. SEO is an ongoing effort that involves off-page strategy as well as on-page strategy. We help you make sure your website is optimized and then we focus on building links back to your site. Roughly two-thirds of successful SEO is based on links back to your site. Email Marketing – A lot of people have abandoned email and placed all their concentration on social media. We believe email plays a very important role today. Unlike Twitter, an email can include a lot of marketing messages and images. It’s very important to setup trigger emails and email groups. Sending out the same email to everyone means you see your customers as all the same. We bet that’s not the case. Social Media – Social media is great but it can also be very damaging to the brand. It’s important to create a communications strategy that includes email. Your prospects and customers should know what benefits they get from joining your social media channels. Again, you don’t want to send everything through every channel. Make sure the message takes advantage of the channel it’s being sent through. We can help you with that. 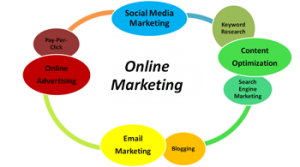 It’s very important to work with a company that specializes in Online Marketing Services. If you want the quality of a jack-of-all-trades go with one company to do everything. If you want to make the most of your marketing dollar make sure you work with a specialized online marketing company like Ontarget.